After receiving his Ph.D. for user interface–related research at the University of Tokyo in 2000, Professor Igarashi spent two years (2000–2002) as a postdoctoral research associate at Brown University. He joined the University of Tokyo as an assistant professor in 2002, and became an associate professor in 2005 and a full professor in 2011. Imagine using a mouse to sketch a picture of a cartoon dog, and when you’re done, the drawing transforms into 3D computer graphics. It has the thin legs and a narrow neck and the pudgy body you expect—the drawing has naturally expanded out into three dimensions in just the way you intended. You add a mouth to your drawing, which the dog opens when you’re done. In just seconds you’ve created a 3D graphical object that looks like a dog when viewed from any angle. You use the mouse to draw another dog, and designate and manipulate movable parts. When you’re done the drawing is automatically animated and starts bounding about on the screen, not with a mechanical flailing, but with an amazingly organic, natural-looking movement. Once again you’ve created in just seconds what would have required far more work using standard modeling or animation tools. “We’re investigating how to use computer technologies to support creativity,” says Professor Takeo Igarashi, who researches computer user interfaces and computer graphics. The first example described above is “Teddy,” a 3D modeling system that creates its models from hand-drawn sketches. This is a project from when Professor Igarashi was a Ph.D. student at the University of Tokyo, partly on a short-term exchange program at Carnegie Mellon University in the United States. It was a surprising project that caught the eye of many researchers and companies, and received worldwide exposure through a story in the New York Times. “One of the wonderful things about doing computer research is that really good ideas will find use around the world,” Professor Igarashi says. There are examples of this all around you—your computer’s mouse and common GUI elements such as windows, icons, and buttons all started out as “really good ideas” that were quickly adopted worldwide. Recently, Professor Igarashi is expanding the scope of his research to beyond computer graphics, aiming at supporting creativity outside of the computer. 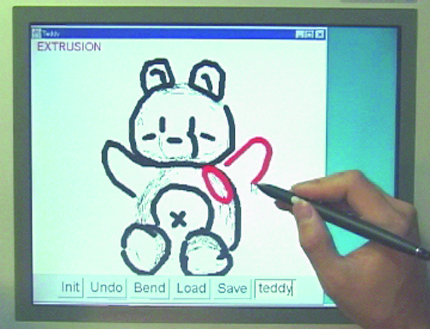 For example, his interactive stuffed animal design system “Plushie” uses hand-drawn sketches for modeling. The program uses technologies from the Teddy project to interactively propose 2D templates for cutting cloth pieces that, when sewn together, create an original stuffed animal. The system is so simple to use that anyone can create their own unique toy. The Igarashi Lab places heavy emphasis on students thinking for themselves. “Giving students a research theme to work on makes for a more efficient lab, but not a very meaningful experience,” Professor Igarashi says. Instead, a respect for student autonomy helps to foster feelings of responsibility. Yuki Koyama (M2) says of the lab, “There is not much rules or regulations. One can work at his own direction. one where we’re left to explore as we choose.” Mr. Koyama is developing CG representation support tools for artists that utilize the strengths of both traditional 2D and 3D tools. Few research projects in the lab are performed cooperatively between students. Instead, cooperation is with major software vendors like Adobe and Microsoft, and with major overseas universities such as Berkeley, Stanford, and MIT, making the Igarashi Lab a development environment in solid contact with the rest of the world. “Teddy” is a modeling system that allows use of hand-drawn sketches to create 3D models. Users use tablet devices or a mouse for input of freely hand-drawn curves on a plane, thereby interactively generating 3D models. Unlike existing sketch-based modeling systems, which are designed to create artificial objects using planes in the shape of primitive solids, Teddy is revolutionary in that it aims to use more natural surfaces to represent the form of animals and plants.